Last month at the Song of My Heart Stampers demonstrator meeting we had a shoebox swap! If you don’t know what that is, it’s a get-together where each participant designs a card and cuts all the pieces needed to create their design. Then the cut pieces, along with stamps, ink and embellishments are placed in a shoebox or other container. Everyone goes around the tables and creates the project in each box. It’s so much fun! At this gathering, the Stampin’ Up! Cherry On Top DSP (Designer Series Paper) stack and coordinating Washi Tape was a big hit! It was used on a whole lot of projects, some of which I’ll share in just a moment. But first, I’d like to show you my project and give you a few measurements in case you’d like to make one of your own. Let’s start off with the Make a Wish greeting which comes from the Perfect Pennants stamp set. This set has a couple of pennants and sentiments along with a heart and a star and can be used for many occasions in addition to birthdays. Here I stamped it with Bermuda Bay ink (one of my favs) and punched it out with the Note Tag Punch. Easy! The card base is a standard 4-1/4″ x 11″ piece of Soft Sky cardstock, folded in half to make a 4-1/4″ x 5-1/2″ card. On top of the Soft Sky is a layer of 3-1/4″ x 4-1/2″ Crushed Curry cardstock. Next, there are two small pieces, 1-1/2″ x 3″, of Cherry on Top DSP, which comes in a convenient 6″ x 6″ stack. You may want to bundle that with the coordinating cardstock pack so that you have all the bright pretty colors to play with! 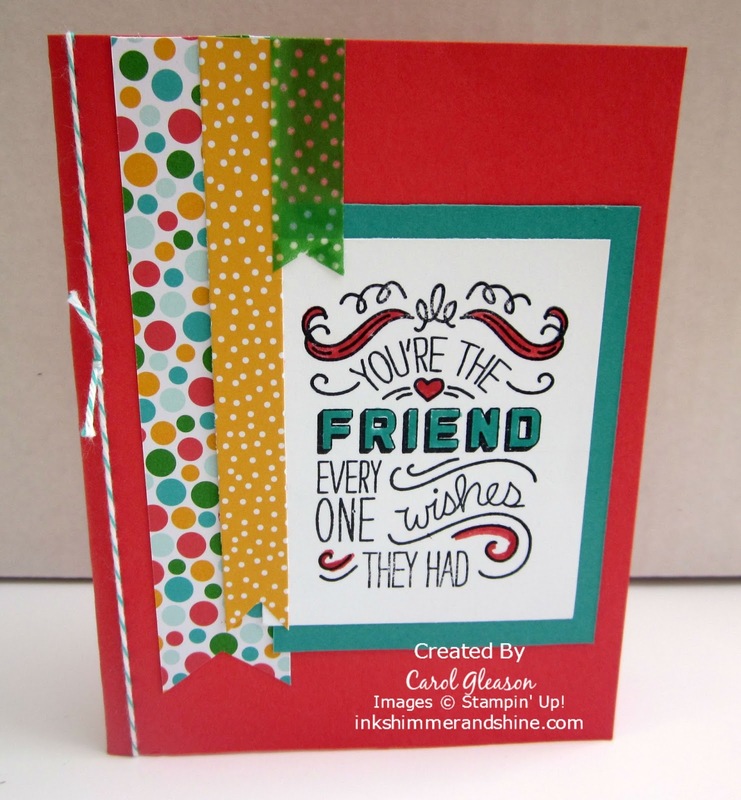 To finish off the card, I punched a tag from Cucumber Crush cardstock (included in the coordinating cardstock pack) with the Scalloped Tag Topper Punch. I used two pieces of Cherry On Top Washi tape to coordinate with the rest of the card. 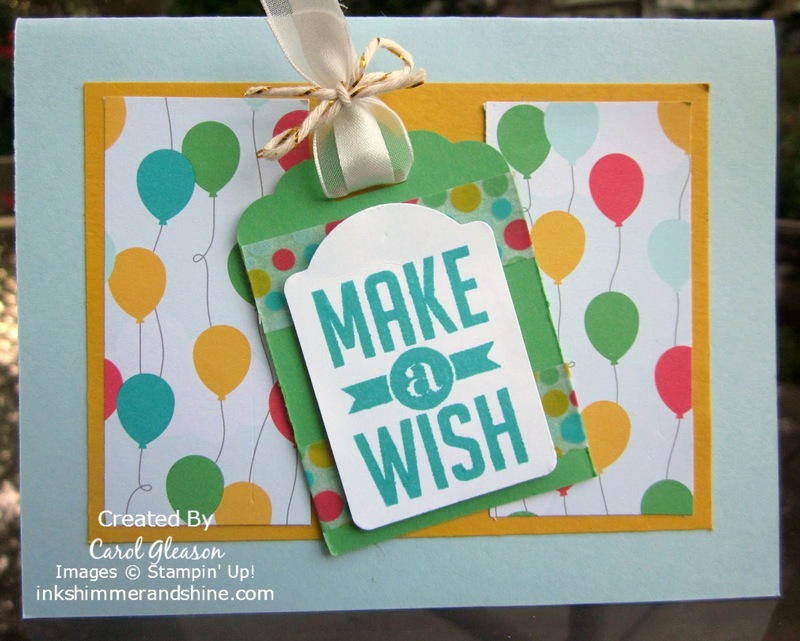 The Make a Wish sentiment is adhered to the tag with Stampin’ Dimensionals. Then add a piece of White Organza ribbon and tie it with Gold Baker’s twine. Adhere the tag to the card and you’re done! Woohoo! 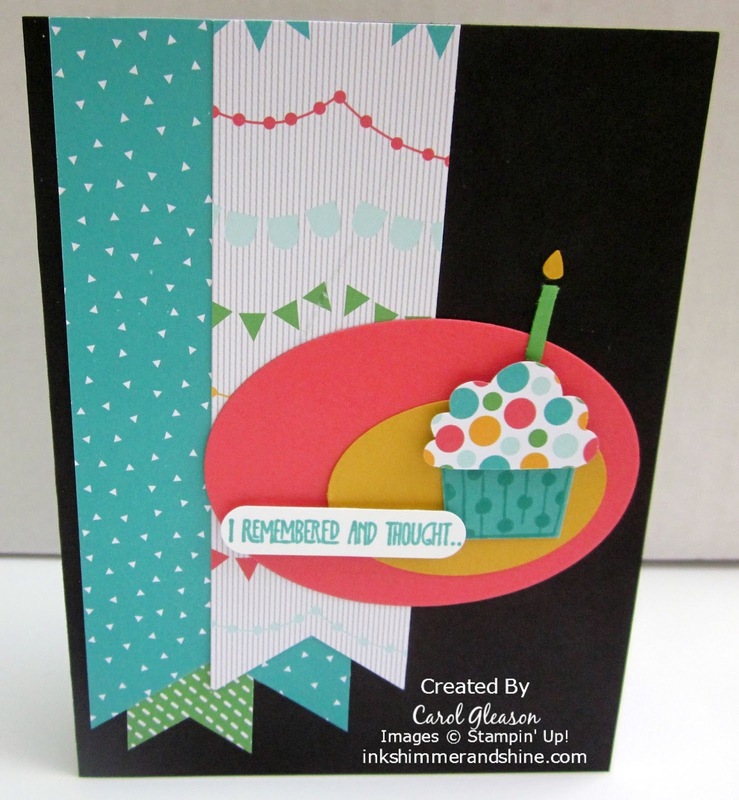 The Scalloped Tag Topper Punch is on the Weekly Deals this week. See all the Stampin’ Up! Weekly Deals. If you need any of these products, be sure to click the links above to go right to the online store. But, before you go, here are a couple of other samples designed by fellow Song of My Heart stampers with the Cherry On Top paper. I love these ovals that are off-center with a cupcake on top! This one was fun to add a little color to the stamp with markers. 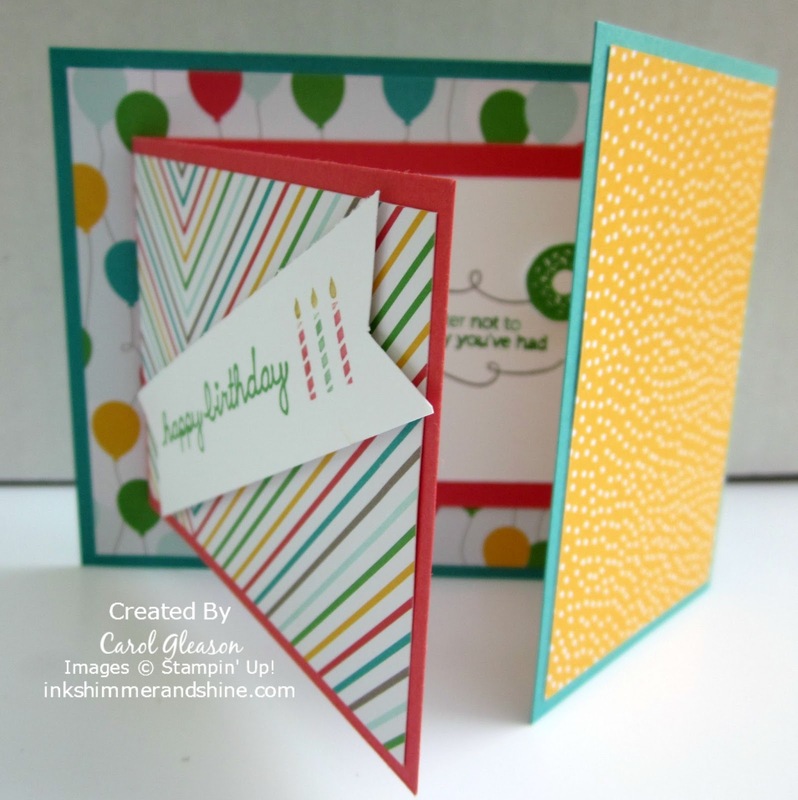 The card base is one of the new in-colors – Watermelon Wonder. Fancy Fold card – This one was a little hard to photograph to show the whole card, so scroll down to see the front and the inside. 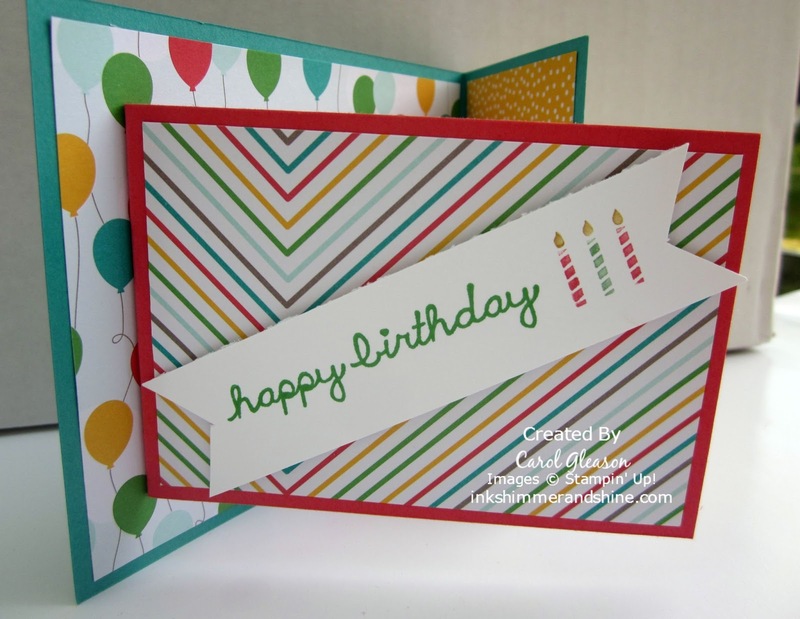 So bright and cheery, and it uses several different coordinating patterns from the paper stack! That’s it for today! Hope you’re having a happy life! Cherry On Top, Note Tag Punch, Perfect Pennants, punches. Bookmark.